"As part of our realignment as a network carrier, we're optimizing our European route network improving connectivity and thereby reinforcing our hubs by means of increased connecting flights"
airberlin is increasing its services on major European routes for the upcoming summer schedule, thereby strengthening its realignment as a network carrier. The additional flights to and from Paris, Warsaw, Krakow and Tel Aviv will be connected to all airberlin's flights between Berlin and the US as well as with all domestic and European destinations. airberlin currently operates nonstop flights from Chicago, Miami, New York and - as of May 2017 - San Francisco and Los Angeles to Berlin. "As part of our realignment as a network carrier, we're optimizing our European route network, improving connectivity and thereby reinforcing our hubs by means of increased connecting flights. These additional services not only mean more flights, but also new connections and shorter transfer times, which are particularly important for business travellers", said Stefan Pichler, Chief Executive Officer airberlin. With an additional daily service, there will be four flights a day from Berlin-Tegel to Warsaw and Krakow as of March 26, 2017. With the new flight, passengers will be able to benefit from a new daily connection between Berlin and Los Angeles (three times a week) and Berlin and San Francisco (four times a week) which airberlin will offer from May 2017 to both Warsaw and Krakow. Ten weekly services will be available between the two Polish cities and New York. The flight program from Berlin to Tel Aviv will be supplemented by an additional daily flight. From March 26, 2017, airberlin will operate two daily services Monday to Sunday all year round. Services to and from San Francisco in particular will benefit from this new flight but all the other four destinations in the US served via Berlin can also be booked as an onward flight with a stop in Berlin. From March 26, 2017 airberlin increases its service of two flights from Berlin-Tegel to Paris to four daily connections with improved departure times from Berlin-Tegel to Paris Charles-de-Gaulle. From the US, there will be up to two connecting flights per day via Berlin to Paris from Chicago, Los Angeles, Miami, New York (JFK) and San Francisco. The flights can be booked with immediate effect online at http://www.airberlin.com, via travel agents or by calling the airberlin Service Center at (917) 261-3165 (local rates apply). 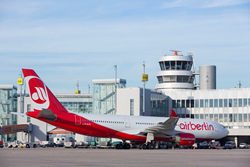 As one of the largest European network airlines, airberlin focuses on high frequency flights throughout Germany and connections from many leading European cities to its hubs Berlin-Tegel and Dusseldorf. From its hubs airberlin also operates long-haul routes to the USA, the Caribbean and the Middle East. The airline flew more than 30.2 million passengers in 2015 and operates one of Europe's most modern and eco-efficient fleets. airberlin is part of the oneworld© airline alliance, a founding member of Etihad Airways Partners and a strategic partner of Etihad Airways, which holds 29.21 per cent of airberlin’s shares. More than four million travellers are member of airberlin’s topbonus loyalty programme.